Wing span: 1 1/4 - 2 3/4 inches (3.2 - 7 cm). Identification: Upperside is orange-brown with large black spots and dark wing borders. Underside looks like a dead leaf and is dark mottled brown with darker wing bases; hindwing does not have a centered silver spot. Life history: Males perch in the late afternoon to look for females. Eggs are laid in bunches on the host plant; caterpillars eat leaves and feed together when young. Adults hibernate. Flight: One brood: Adults emerge in June and fly until fall, then overwinter. They fly the following spring until April or May, mating and laying eggs for the next brood. Caterpillar hosts: Various species of wild lilac (Ceanothus). 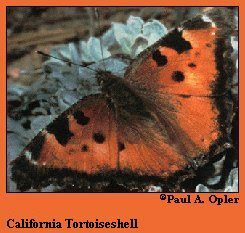 Habitat: Chaparral, woodland, brush areas, forest clearings and edges. Range: British Columbia south along the Pacific Coast to Baja California Norte, east to Montana, Wyoming, Colorado, and New Mexico. Rare migrants to Michigan, Pennsylvania, New York, and Vermont after periodic population explosions in Mexico.